Ranged water unit, able to attack air and sea. Critical hit when in reef. Harpoon Ships are water units. They are indirect attackers who can move and fire on the same turn, and they attack at long distances. Harpoon Ships can fire on air and sea units, and deal extreme damage vs Turtles specifically. However, they deal minimal damage to Warships and cannot engage buildings or ground units at all. They're available to recruit from a Port. When they're on a reef tile while attacking they'll perform a Critical Hit. Harpoon Ship Cherrystone Kingdom Each Harpoon Ship is armed with bolts that have been tipped with dragon scales and imbued with lightning by Cherrystone's artisan mages. A single bolt weighs upwards of 130kg, and travels fast enough to catch a Fellbat soaring amongst the clouds. Harpoon Ship Felheim Legion The Deepfolk who serve Felheim cover their Harpoon Ships' sharp bolts with bioluminescent algae. When fired at night, the algae disperses in the air, dimly lighting the area for miles around, and exposing the positions of airborne foes. Harpoon Ship Heavensong Empire Heavensong's Harpoon ships are armed with powerful glass-tipped bolts, each more expensive than the ship itself. The glass is razor-sharp, produced from the fine sands of Dragon's Graveyard, and can be rigged to shatter before impact, spraying shards into the air at alarming speed. Harpoon Ship Floran Tribes When not at war, the Floran Harpoon Ship, armed with its gigantic bonehead bolt, is used by the Floran to hunt the gigantic beasties of the West Sea. The ships are built to bring down kraken and leviathans, and have proven effective against both. 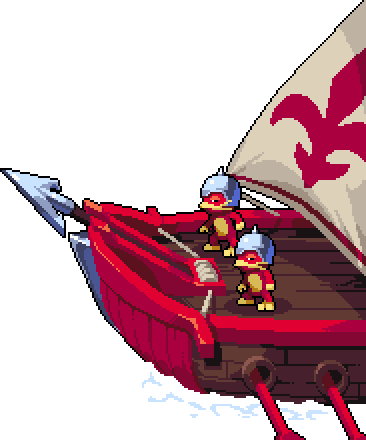 The Floran that man the Harpoon Ship stay at sea for months at a time, returning home to great esteem and recognition should they succeed in their hunt - and great shame should they fail. This page was last modified on 15 March 2019, at 16:51.